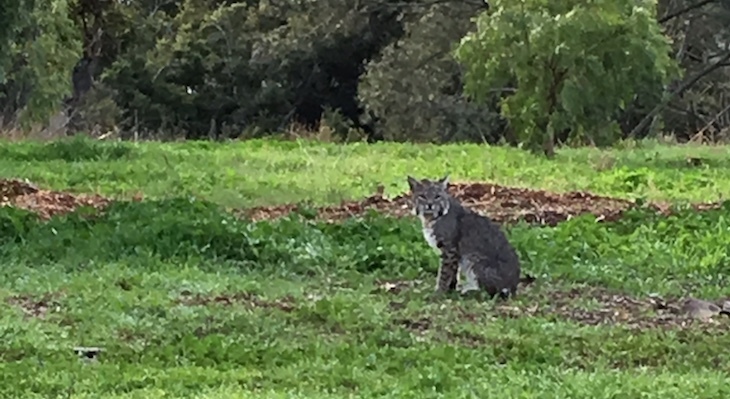 Yikes it was a big Bobcat at Jesusita trailhead water plant. Everyone be careful this was at 8:30am Sunday. Another good reason to obey the law and keep your dog on a leash when hiking. Pretty kitty is shy, won't hurt you. Saw one on More Mesa last month. What a lucky sighting! How I love our local native wildlife! Nice. I saw one on East Camino Cielo today, standing in the middle of the road above San Ysidro canyon. "Everyone be careful." I say to the Bobcat: "Beware of humans." Pretty! You're lucky, you might go decades without seeing another one!